The central state of Pahang has a long coastline, a large and extremely old rainforest, and highland areas thanks to the mountain range that goes down the state from north to south. The highlands are popular for their mountain resorts. Pahang is one of Malaysia's biggest states, mostly mountainous or hilly, about 60% covered by fern-rich jungles. It has cool mountain weather and sandy beaches. In the northwest corner of the state, near the borders of Kelantan and Perak, are the Cameron Highlands, which enjoy a temperate climate, ideal for tea plantations and vegetable farming. 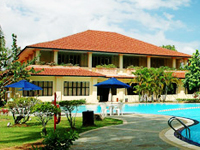 It has luxurious bungalows and first-class sports facilities. Another top leisure destination with many hotels, a casino and theme park and set hundreds of metres above sea level, the Genting Highlands, is further south, on the Pahang-Selangor border. A hundred kilometres north of Kuala Lumpur is the summer resort of the British in colonial times, Fraser's Hill, which has Georgian colonial architecture mixed with modern buildings. The pretty resort town is built on seven hills, and is a favourite of golfers and birdwatchers. Pahang has Malaysia's biggest national park, Taman Negara. Teeming with rare animals, this huge jungle is 130 million years old. Pahang also has the Malaysia's biggest freshwater lake, the protected Tasik Bera, where some aboriginal Semelai Orang Asli live. Pahang was part of a Chinese-Siamese empire for a thousand years, and then part of the Siamese Kingdom for another 300 until the Malaccan empire took over in the 15th century. Most of Pahang's residents are Malay, but about one third are Chinese. Pahang's terrain flattens out near the coast facing the South China Sea. The dynamic state capital of Kuantan is on the coast. Kuantan is a major producer of native products such as pandan-leaf mats, wood carvings, batik cloth and the handwoven brocade known as songket. The capital is also known for the beaches to its north, the nearest being Telek Chempadek, just 5 kilometres away, which attracts visitors due to its myriad water sports venues and seafood cuisine. Next to it is Besarah, a picturesque fishing village. A little farther away, 45 kilometres from the capital, is Cherating, with its tourist resorts and surfer-friendly white sand beaches. Among Pahang's 60 or so islands, Tioman is the biggest and most widely known. The film South Pacific was shot here. Aside from scuba diving and snorkelling, Tioman also offers jungle trekking.